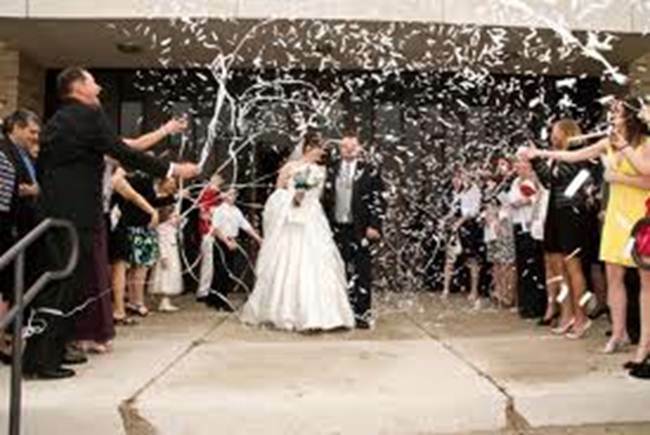 Shauna Godwin was just one of many future brides who have walked into South’s Clothiers at the Boone Mall in search of the perfect wedding dress. Months later, following numerous consultations and fittings, Shauna had only to glance into a mirror to see that she had, indeed, found the perfect gown. On Sept, 10, 2011, Shauna was a stunning bride adorned in her gown of diamond white satin as she exchanged vows with Adam Hamby on the lawn at the Taylor House Inn in Valle Crucis. “It was an absolutely perfect day in every way” Shauna says. Shauna chose to wear her grandmother’s wedding ring as her “something old.” Her dress was “new, she “borrowed” her grandmother’s champagne diamond necklace and she wore her “blue” leopard print Toms (shoes). “My matron of honor was in black and everyone wore their own purple shoe,” Shauna says. The groom and his attendants were attired in black tuxedoes with charcoal gray vest and ties, also from South’s. Sharing a varied musical interest, Shauna and Adam chose an eclectic selection of tunes for the occasion. Swing and jazz ruled the cocktail hour. “As the night progressed, it got louder with more contemporary, pop music,” Shauna says. As a dancer and dance instructor, Shauna insisted on “lots dancing” including a clogging hoedown and an impromptu Zumba, with her mother and Vanessa Minton. “It was great,” she says. The reception menu included smoked brisket and barbecue chicken prepared by her uncle, Steve Williams, from Texas. “We grilled vegetable skewers and portabella mushroom caps, had a baked potato bar, salad and bread, catered by Bandana’s,” she says. “The cake was white with raspberry filling and white butter-cream, made by Nicole Palazzo of Sorrento’s Bistro. I also had an amazing vegan carrot cake from EarthFare. Her flowers, from Shady Grove Nursery, were arranged by her mother, sister and a close friend. “My bouquet included blue hydrangeas cut from my grandfather’s grave, which was very special to me,” Shauna says. Adam likes to be outside hiking, camping and playing with their dog, Kona; he also likes sports. Shauna loves dance, theatre, Pilates and working out. The couple began dating Sept.3, 2007; Adam proposed Nov. 29, 2009. and the rest is history at least in the making. Following “four wonderful years in New York,” she came home for a “temporary visit” or so she thought. Shauna is currently an instructor at Northwestern Studio and High Country Dance Studio, both in Boone, and at Xtreme Dance Company in Bristol, Va.
She is the coach of the Mini Mountaineers Dance Teams, choreographer of both the country Clogging Jamboree at Tweetsie Railroad and of Watauga High School’s spring musicals. She is the owner of Connected Dance Convention, The Miss High Country Pageant System and The Pilates Effect. Shauna is also co-owner, with her mother, of The Dancer’s Corner Boutique in the Shoppes at Farmer’s Hardware. As if all that’s not enough to keep her busy, she is preparing to graduate in May from Appalachian State University with a double major in dance studies and theatre performance. Shauna is the daughter of James and Teresa Godwin of Boone and the daughter in law of David and Teonnie Hamby of Sparta. She and Adam make their home in Boone. Once the decision has been made regarding vendors, Shauna recommends contracts with each party. Hers was “a super tight budget,” but she made good use of her resources and connections, she says. “There is a lot that you can do for and by yourself,” Shauna says. “You don’t have to be incredibly artsy or talented, just think creatively.